Jeremy Vearey was born in 1963 in Elsies River. He describes the area as a ‘different Elsies River’ than today as it was only around 50% built houses. It was a working class environment, and entirely Afrikaans speaking.Vearey grew up in a section that was more ‘informal’ settlement in a large family, with both sets of families.His grandfather and father did all the slaughtering of animals in the area, a skill which he learnt by helping them.His grandmother on his mother’s side lived in that area. When a section of Elsies River was designated Indian (Cravenby Estate) Vearey had his first exposure to English. Vearey found concentrating a challenge in school from a young age but was extremely active. He played rugby and participated in long-distance track running. He attended Greenlands Junior School and then John Ramsey High school. His father was in and out of employment and he helped his father selling meat and veggies from horse cart. His mother, Annette Vearey, was a trade unionist, a member of General and Allied Workers Union (GAWU), and a shop steward which meant she was a target for the factory owners. As a result, she was constantly fired due to labour disputes from various textile factories in the northern suburbs. GAWU was a conservative union in the sense that they were not concerned with broader political issues but rather focused on the workers. Vearey terms this a ‘workerist’ approach in an interview with Amandla! in 2013. 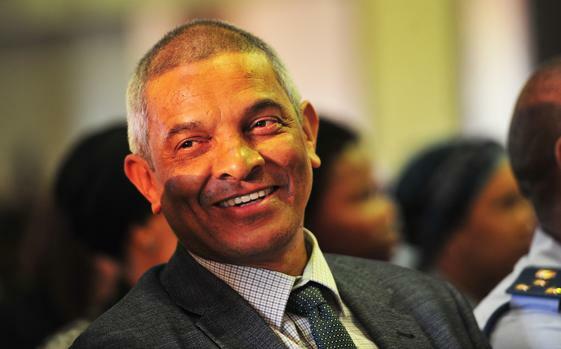 Vearey’s father was also politically active and was an alderman before becoming one of the first ANC councillors in the Theewaterskloof region. Vearey was exposed to various political ideas during his high school years. His primary political teachers were, unironically, his teachers at John Ramsey High School. His teachers taught him about black consciousness and were heavily influenced by the Non-European Unity Movement. They were to be part of the New Unity Movement when it was formed in 1985. Through these teachers, Vearey was exposed to different ways of thinking about eras and material change, as well as different literature by writers such as Chinua Achebe. He was even able to read the Communist Manifesto by Karl Marx in Afrikaans despite the book being banned in English. The reason for this was that the text in Afrikaans was deemed by the banning committee to be of greater use on academic circles and so did not need to be banned for wider use. In this way, Vearey was exposed to Marxism in general, and more specifically, a variation of communism called Trotskyism which was prevalent among the Unity Movement teachers. Vearey began his tertiary studies at the University of the Western Cape (UWC) in 1982. He was was granted a bursary for a lower secondary teachers diploma but he did not attend class regularly due to his activism. Indeed, when Vearey did attend class, they were not classes related to his degree. Rather, Vearey widened his education by attending philosophy classes, among others. University provided a further environment for learning due to the activism of the ANC and UDF at this time. Vearey was part of the founding of the Elsies River Youth Movement which followed more ANC type of thinking. , via his church, at church organised camps. It was here that he met ANC cadres, and He was then the recruited into umKhonto We Sizwe in 1984. In 1985, he started teaching in Elsies River at Valhalla High school, teaching English and Afrikaans. Vearey was part of the group that founded the Western Cape Teachers Union (WETU). This was the first time a teachers union had been started. Vearey describes it as a ‘formidable structure’ and was a forerunner to the South African Democratic Teachers Union (SADTU). All the members, including Vearey, were dismissed from their teaching positions as a result of political activism. Vearey then took a slight detour from his teaching career working as a DJ, focusing on jazz and hip hop. While he was doing this, however, he was still working as an MK operative, hand grenading police officers houses and blowing up railway lines. He eventually went back to teaching, at a primary school in Mitchell’s Plain. He worked to create a very low profile, as a conservative teacher concerned with the curriculum. His cover was blown in 1987 and Vearey was alongside other members of his MK cell.Vearey was arrested in his classroom despite the fact that he was given a heads up that the police were on the way. He decided to remain and finish his revision lesson with his students for that day. He was put on trial with 15 others for terrorism. Due to the cell structure, they did not know one another apart from the other members of their cell. A deal was made with the prosecution, with the agreement of those involved, and certain members took the fall in order for others to go free. Vearey was sent to Robben Island in 1988. He was recruited into the Communist party (CPSA) on the island. He would continue teaching English and Afrikaans to other political prisoners, even helping a warder through matric. He was a political commissar in the CPSA, responsible for the political education of other prisoners in the underground. They would transcribe books and distribute chapters of them around, in order to stop them being confiscated. They would then hide the books in plastic below the bath or change the cover of the books in order to preserve the literature and hide it from the authorities. Other activities on the island included rugby and soccer, he played lock and centre half respectively. Vearey was released from Robben Island in June 1990 but had to immediately go underground due to the turbulent nature of South African society at the time. The political prisoners were in the difficult position as they had been exposed by being arrested and so were targets for the apartheid police in the dying days of apartheid. As a result of underground agreements made by the ANC, Vearey trained in the UK with the SAS with regards to VIP services. He also received surveillance training with Zimbabwe, up until 1993.He was part of President Nelson Mandela’s protection detail when he was travelling abroad, specifically in the intelligence unit. As a result, Vearey travelled all over the world in this capacity. He was not only acting in a protection capacity at this time, however. Vearey was also acting as a source handler during this time, gathering information from sources around the world for the ANC’s intelligence structures. In 1994, Vearey was integrated into the newly formed National Intelligence Agency (NIA). The work he did in this capacity is classified . He was then part of a group that moved from the NIA to the police and worked in the covert unit from 1996. Vearey completed a specialist course on violent crime which started him in gang/organised crime. Vearey explains that this required a new way of doing intelligence work as organised crime is more network based, rather than structurally based. As a result of the way in which South Africa transitioned to democracy, Vearey had to work alongside many of the police who had captured and tortured him. He has worked as a detective for the last 20 years and is now the deputy provincial commissioner for detectives in Western Province.Vearey has also written his biography entitled ‘Jeremy Vannie Elsies’.